I have a friend whose mom is pretty crafty and she makes a lot of themed crafts and recipes, especially during the holidays. When she showed me these Halloween Cookies, I knew I had to share them with you because, I mean, how could I not? I think they’re just the cutest Halloween sugar cookies. You NEED these stands, y’all. 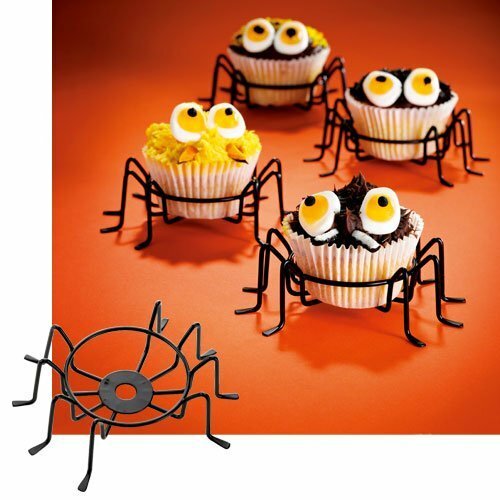 These adorable SPIDER LEG STANDS are a MUST for your Halloween festivities. There are so many different ways to use them, like with these Rolo Halloween Cookies or with some spooky cupcakes. The CHEAPEST place I’ve found them is Amazon and the BEST PART — you can buy them while still in my jammies. And if you have Amazon Prime, you’ll get FREE 2-day shipping. If you don’t have Amazon Prime, get your FREE TRIAL here. Cookies, candy, and sprinkles! It’s a girl’s dream, y’all. 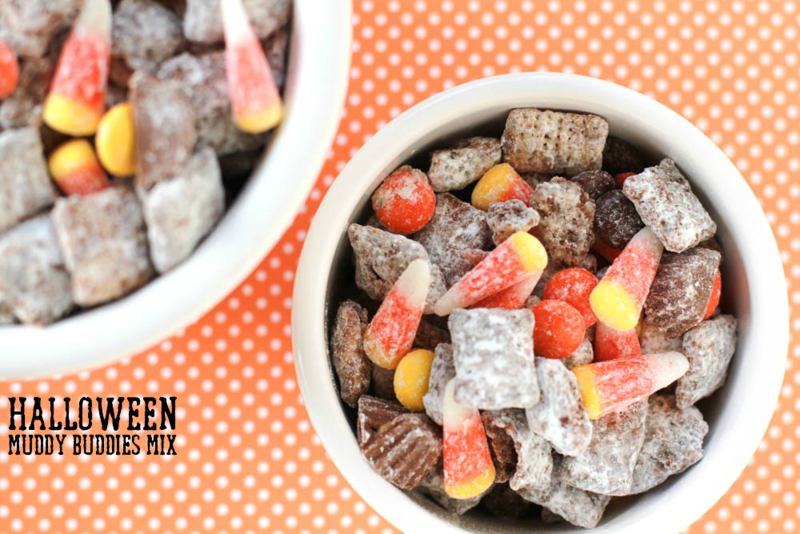 Create a spookingly delicious Halloween candy with premade sugar cookie dough and chewy Rolo caramels! These Rolo Eye Cookies are a great Halloween cookie. Preheat oven to 350 degrees and lightly spray a cookie sheet with vegetable spray. Place sprinkles and colored sugar crystals in individual bowls; set aside. Pull apart the cookie dough from the sheet and roll each ball into a bowl of sprinkles or sugar crystals. Place each sugar-covered cookie ball onto the prepared cookie sheet. Be sure to space cookies at least 2 inches apart. Bake cookies at 350 degrees for 11-14 minutes or until golden brown. Carefully remove the cookie sheet from the oven and transfer cookies to a wire rack to cool. While the cookies are still warm, place a Rolo Candy piece in the middle of each cookie. Next, gently press the candy eye into the middle of the Rolo piece. If your kids like to help in the kitchen, this is the perfect halloween cookie recipe for that! Little hands can help roll the dough in the sprinkles and top with a Rolo candy. Just make sure the Rolo’s actually end up on top of the cookie – instead of in little mouths. Not that I know from experience or anything. Some Halloween cookies recipes can be difficult, but I like easy, so these Rolo Halloween Cookies are really easy. To make it easier to apply the different colored sprinkles and colored sugars to the cookies, place each color in its own individual bowl. Once you’ve pulled apart the cookie dough from the sheet, roll each ball into a bowl of colored sugars or sprinkles. Then you can place the cookie ball onto the prepared baking sheet. Trying to do it once they’re on the cookie sheet just makes a big mess. Learn from my mistakes! Then once the cookies are cooked through and golden brown, remove them from the oven and transfer them to a wire rack to cool. While they’re still warm and soft to the touch, place a Rolo candy piece into the middle of each cookie and gently press down. 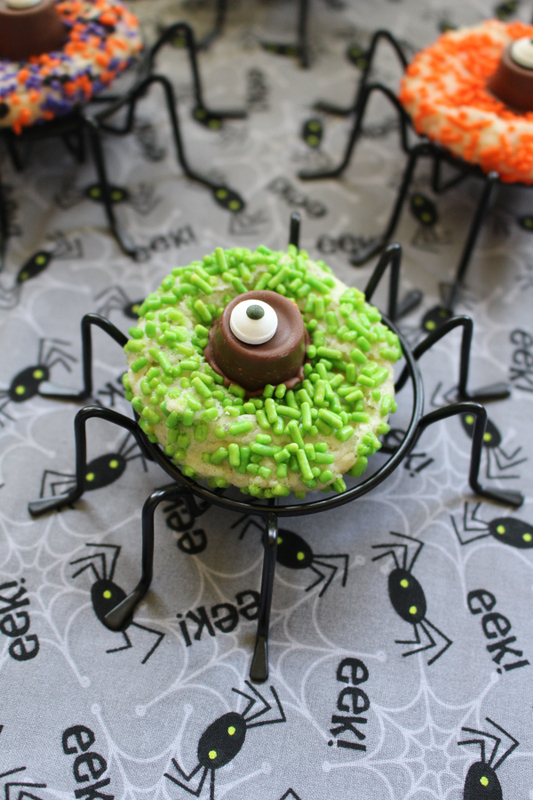 And aren’t those cupcake spider stands just too cute for words? If you’d like to own your own set, you can purchase them from Amazon. They’re obviously for cupcakes, but we used them to display these super cute Halloween sugar cookies. And we think they turned out adorable, but we may be biased. 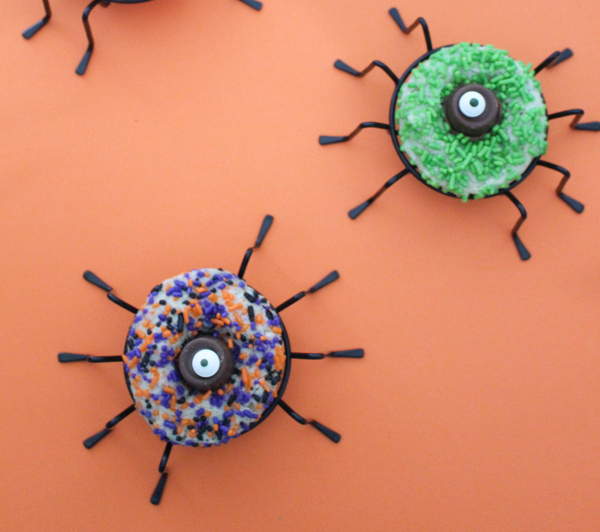 Don’t forget to pin this adorable Halloween cookies to your favorite Halloween board on Pinterest. If you need any of the items used in today’s recipe, most are available on Amazon. If you do make a purchase using my link, it’s like making a small donation to the site because I earn a VERY small percentage. Happy Halloween, y’all. I can’t wait to dig in to all the fun Halloween treats! What Halloween treat are you most excited for? Those are incredibly cute. My kids would love to come home from school one of these days and find these waiting for them. Those are so cute! These are the reason I love Halloween so much. OH my goodness those are the cutest cookies EVER. I love Halloween and all the fun treats. Thanks for sharing your idea! These came out so cute and they look yummy. I need to make some for our Halloween party. I love these cookies! How cute and how fun. These are great looking cookies – I plan on making these with my niece this Halloween Season. Oh my gosh- those are so stinking cute! And definitely perfect for Halloween! The cupcake stand you used are taking this post up a notch. They are so fun and perfect for the eyeballs! I just love everything about these from the stands to the funky frosting, and of course the creative eyes too. They seem really easy to make for being so cute! Ok I’ve been holding back on posting Halloween food but have had so much cuteness going on I can’t take it! These are adorable! So simple but so unique and spooky! Love them. These are the funniest cupcakes I have ever seen! 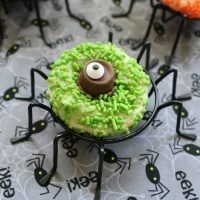 I love the spider cupcake holders! How adorable yet simple to make – thank for the idea! I love how cute they came out! These are really cute my kids would love if we had these. Yum. These look awesome. My kids would love these. I love the little spider stand, that is really cool! Adorable one-eyed spider cookies. They look so good. Those spider stands are awesome. Oh my gosh, I love these, hahaha! My kids will get such a kick out of them, and these would be a hit at a party! These cookies are so adorable. I will have to try making some for the kids. I hope mine turn out as cute as yours. Love your cookies! They are sooo cute! I am going to try to make them! OMG!! This is perfect this coming halloween, I’m sure my little son would love to see this. It’s so great that they are simple. Sometimes I get overwhelmed at festive treats that take a lot of prep. I’m sure they are so yummy too with that rolo on top! Those are sooooo cute I pinned them to my Halloween board. 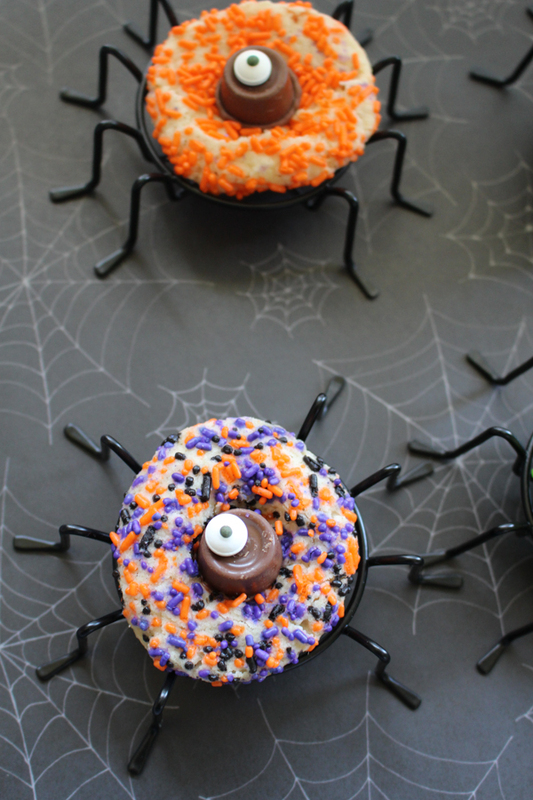 I love treats that are cute spooky not creepy and these are perfect. These are some seriously adorable cookies! 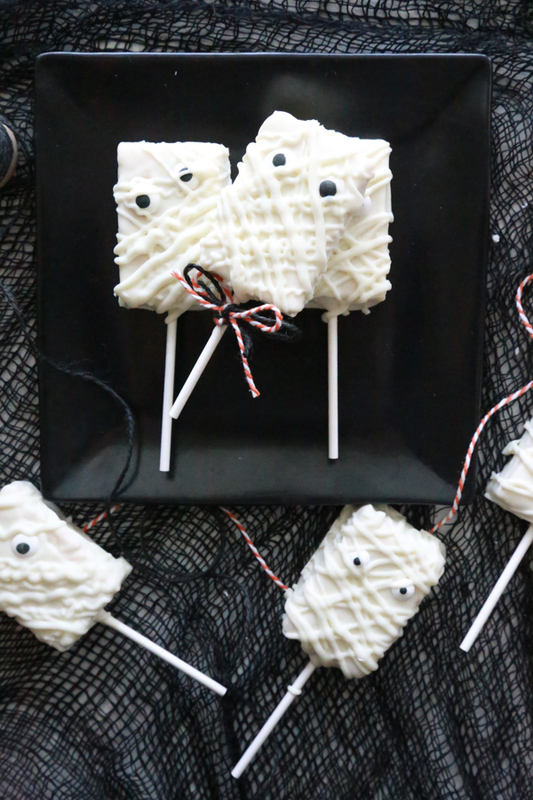 We love Halloween and making fun, spooky treats to celebrate the occasion. These are perfect. rolos are one of my favorite candies ever! I love a cute cupcake and this fits the bill. 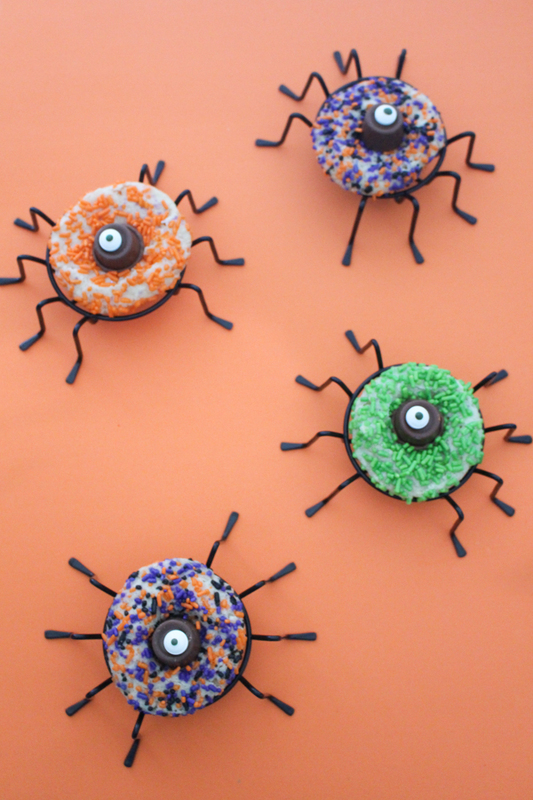 I am going to make these for my nieces who will enjoy the frosting and sprinkles most of all. These are so cute Crystal! Oh those are too cute! I love easy recipes like that, especially ones that turn out so cute!